The 1st Annual Timber Creek Women’s Golf Tournament is the only women-only golf tourney in the Twin Cities this season! 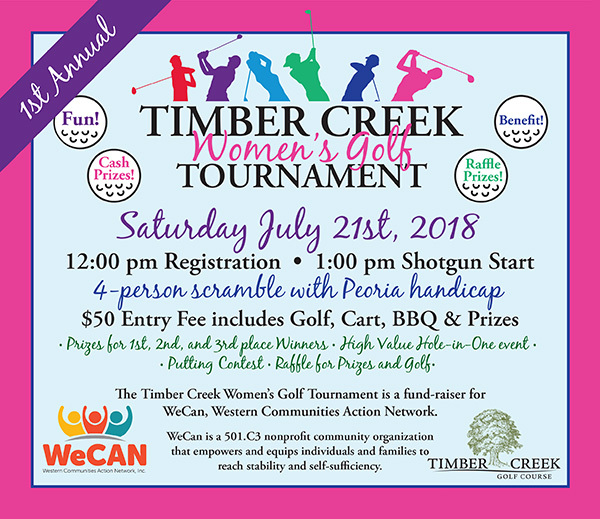 This is a 4 person scramble event to benefit WeCan, the Western Communities Action Network, and to promote Timber Creek Golf Course as the premier metro venue for women’s golf. This event is open to all women, no matter their home course. Registration is $50 and includes 18 holes, cart, barbecue and awards. There are several events featured at this event including a $5K Hole-in-One, Beat the Pro, Putting Contest, and Longest Drive. There is also a raffle with prizes ranging from private lessons with PGA pro Kevin Williams, a $250 membership to Fit Body Boot Camp, and rounds at Superior National. For more information, contact the clubhouse at (952) 955-3600 or watch our Facebook page at Timber Creek Women’s Golf Tournament. The event is being sponsored by Anne Jerde Rothstein agency of American Family Insurance. Gold and silver level sponsorships are available as are hole sponsorships. For more info on sponsorships, contact Suzanne@WildTHreadsOnline.com.